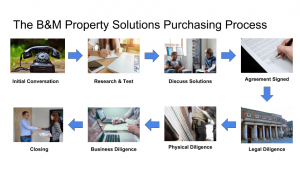 Physical Due Diligence - B&M Property Solutions, LLC. Physical Due Diligence is the third to last step in the B&M Purchasing Process. This part of the process allows B&M to verify and evaluate the physical condition of the land and property. During this stage of the process, we engage a variety of specialists to help us determine the current physical condition of the property as well as evaluate the ability to execute repairs and improvements. We will work with you to determine a day (typically Wednesday or Thursday) and time (usually 9:30 AM or 1:30 PM) for our physical due diligence team to view the property. 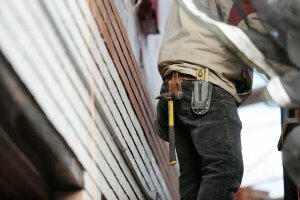 Our physical due diligence team includes licensed inspectors, surveyors, general contractors and other specialists depending on the property repair and improvement strategies we may be considering. We typically couple our physical due diligence team with our business due-diligence team (appraisers, private lenders, other investors, agents, partners, etc.) in order to minimize the disturbance to your and/or your tenant’s daily life. These inspections and walkthroughs typically take less than three (3) hours total. Physical Due Diligence is necessary to help us determine the feasibility of the potential exit strategies we evaluate during the next step of the B&M Purchasing Process, Business Due Diligence.